AT&T completed its acquisition of DirecTV on Friday, and with one fell swoop it became the country's biggest provider of TV subscriptions. AT&T CEO Randall Stephenson celebrated the deal, saying the addition of DirecTV makes AT&T a "fundamentally different company" that can offer people "more choices" for communication and entertainment. AT&T is already one of the biggest suppliers of wireless phone service in the United States. Soon it will start promoting new ways to watch TV programming on mobile phones. And the company is likely to pitch a bundled product that includes TV, wireless phone service and wired broadband. Stephenson's announcement came shortly after the five-member Federal Communications Commission voted to approve the $49 billion transaction. The approval came with significant conditions attached, some of which were meant to ensure that AT&T won't give its own video services a leg-up over competitors. The conditions also involve expansions of AT&T's super-fast broadband Internet service and discounts for low-income households. 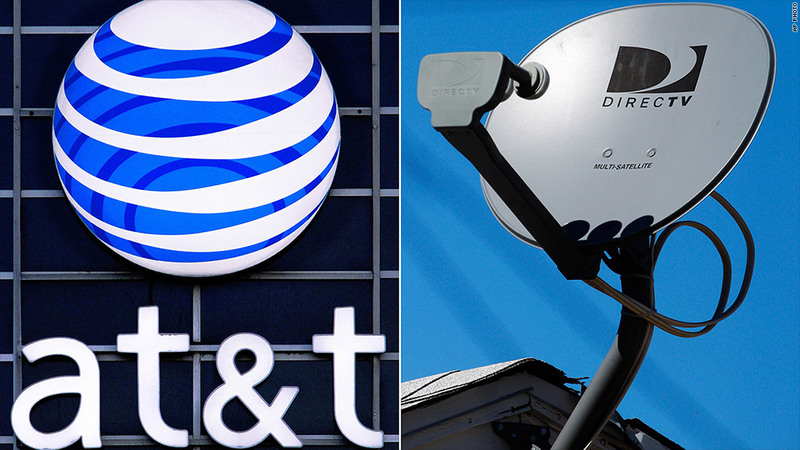 AT&T said its operations would be merged with DirecTV's "over the coming months." Service won't suddenly change for existing customers -- NFL Sunday Ticket will remain available through DirecTV -- but AT&T said it would "launch new integrated TV, mobile and high-speed Internet offers that give customers greater value and convenience." The company's frequently asked questions says "we will not increase prices as a result of this acquisition." Together, AT&T and DirecTV will provide TV to about 26 million households in the United States -- more than a quarter of all the homes that pay for some form of a TV bundle. Comcast, formerly the biggest seller of TV subscriptions, will be No. 2, with slightly more than 22 million households served. While Netflix and other streaming companies are making inroads, the vast majority of American households rely on monthly packages of broadcast and cable channels sold by companies like AT&T. DirecTV provides satellite TV service. AT&T's newer, smaller U-verse is a cablelike fiber-optics service. U-verse is only available in a limited number of markets, so having DirecTV lets AT&T pitch TV/phone/Internet packages to a greater number of households. Stephenson said, "We'll now be able to meet consumers' future entertainment preferences, whether they want traditional TV service with premier programming, their favorite content on a mobile device, or video streamed over the Internet to any screen." The two companies agreed to merge in May 2014. The government approval process took more than a year. Regulators said they needed the time to review and address the potential harms of the deal. Earlier this week the Justice Department signed off on the corporate combination and FCC Chairman Tom Wheeler also signaled his support. That's what spurred Friday's vote by the five commissioners. Wheeler said that the conditions attached to the deal will "directly benefit consumers by bringing more competition to the broadband marketplace." The company will have to submit regular reports on "network performance" to the FCC. And the FCC will require an "independent officer to help ensure compliance with these and other proposed conditions."